Just yesterday I posted about one Ultra HD TV. And here comes another. Yes, it seems, the competition in the Smart TV sector is about to get as hot as in the area of smartphones. Well, all the better for us consumers. Anyway, the news is that LG has recently expanded their line of Ultra HD TV with the launch of their latest 55 inch and 65 inch 4K ULTRA HD TV designed to provide the viewers with stunning display and incredible audio quality. Tru-ULTRA HD Engine: LG’-ULTRA HD Engine is capable of up-scaling any video format to ULTRA HD picture quality. Using LG’s proprietary Super Resolution algorithm called 1000 MCI, the Tru-ULTRA HD Engine of these televisions promise to efficiently maximize image clarity and enhance the quality of the image by increasing the sharpness and removing any blurring that might have arisen during the up-scaling process. Nano FULL LED backlighting: These latest Ultra HD TVs by LG also have Nano FULL LED backlighting that ensures better illumination control which improves the picture contrast and delivers consistent brightness across the screen. These TVs are also equipped with an IPS Panel that enables the viewers to watch the television program from almost anywhere in the room without facing the problem of picture distortion. 3D Experience: The ULTRA HD screen resolution of the recently launched models and the the FPR 3D technology promises to deliver stunning and crosstalk flicker-free 3D images that can be viewed by wearing the lightweight 3D glasses. I haven’t seen these glasses so I can’t say just how lightweight and convenient these are, but LG claims them to be quite comfortable to wear. The recently launched Ultra HD TV models of LG are also equipped with 2D to 3D conversion engine, thus even the 2D content can be converted to deliver the 3D experience. Dual Play Feature: What I found really interesting was the Dual Play Feature of these teleivsions. This feature makes it possible for two players to simultaneously see only their perspective on the screen. That is, each player can see their own perspective of the game on the full screen of the television, and not just on one portion of the split screen. To use this feature, the players need to wear the special glasses. Audio Quality and Sliding Speaker: Stunning visuals alone can’t deliver an optimum TV viewing experience. Audio quality is as important as the video quality. And to ensure a good audio quality, LG’s latest launched models of Ultra HD TV’s have a virtual surround plus feature, a 4.1 channel, 50W sound system. These TVs also feature Sliding Speaker. This is an ingeniously concealed sound bar that has four forward-facing speakers. These four speakers promise to deliver an excellent quality of room-filling audio through the mid and high frequency ranges. This Sliding Speaker can be programmed to stay hidden or extended permanently. Or it can also be programmed to noiselessly slide out whenever the TV is switched On, and to retract and hide when the TV is Off. The newly launched Ultra HD TV models of LG also have a powerful subwoofer that’s positioned behind the display screen and is designed to deliver a strong bass performance. 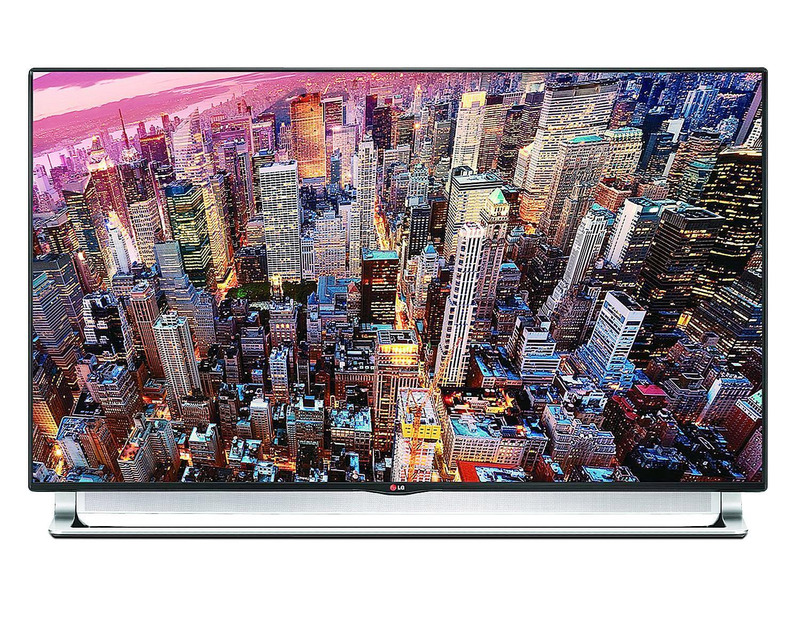 Design: LG’s latest ULTRA HD TVs boast of possessing the subtle aesthetics and narrow bezels of LG’s CINEMA SCREEN Design that is a modern, stylish and yet functional. According to LG, the narrow bezel and the stand with its subtle chrome finish are designed to remain unobtrusive and stay true to the simplicity and minimalist approach of the design. Smart Apps: Of course, the two newly launched models are both Smart TVs. And thus, they are equipped to make use of various smart apps and content services. For example, using the Skype, users can make voice and video calls right from these Ultra HD televisions. And of course, users can play various games which are sure going to prove even more fun on 55 inch or 65 inch Ultra HD television. Magic Remote: Being ‘Smart’, these Ultra HD television can be controlled using voice and motion commands. Their Magic Remote feature enables these smart TVs to recognize natural language, and understand the point, wheel, and gesture control options, There’s also a feature called Now On that can offer content recommendations based upon the user’s viewing habits. Wireless Connectivity: These televisions also offer various wireless connectivity options like WiDi and Miracast that enable screen mirroring. There’s also NFC-based Tag On feature that enables convenient device pairing. These Ultra HD TVs also have Wi-Fi, USB and HDMI connectivity options. Record Live Television: These smart TVs also have embedded time machine that makes it possible for the users to record live television. Camera: Yes, there’s also an inbuilt camera. Thus the users can easily make video calls on these televisions, and likely also capture still shots or videos. All in all, the newly launched 55 inch and 65 inch Ultra HD Smart TVs by LG sure seem very promising when it comes to delivering a superior audio visual experience, gaming thrill and the convenience of Smart features. But all this doesn’t come cheap. The two newly launched 55 inch and 65 inch models of LG’s LA9700 Ultra HD TVs are priced at Rs.3,30,000 and Rs.4,50,000 respectively. These can be bought from the LG best shops across India. How far can a person go to fulfill the dreams of someone else?